Lorraine Connelly-Northey, ‘Narrbong’, 2018. 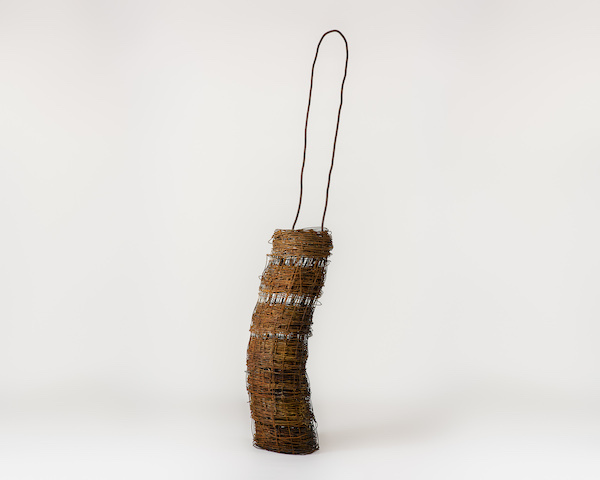 Ring lock wire and reinforcing rod, 187 x 35 x 35cm. Courtesy: the artist and Roslyn Oxley9 Gallery, Sydney. Roslyn Oxley9 Gallery presents its first solo exhibition by Lorraine Connelly-Northey titled Narrbong-galang, which is the Waradgerrie word for pouches of the marsupials. Connelly-Northey’s artistic practice is influenced by her western and Indigenous heritage. Respect for the land and the Murray River informs her practice, the work of Connelly-Northey references the gathering of food and resources for thousands of generations by her Ancestors. This practice is embedded in her own artistic development, ardently collecting found materials and re-envisaging them into sculptural forms of narrbongs and koolimans dishes used for collecting, winnowing and cradling along with canoes used to travel and gather on the river. Transforming found materials into inspired creations imbued with meaning and life.